Our aim is to work in close partnership with the parent(s)/guardians, working hand in hand enable us to provide a unique childcare facility that is consistent and reflects the routine that is in place at home. We know that the closer our nursery team work with parent(s)/guardians the more rewarding and enjoyable their child's time in nursery will be. Our low staff turnover created by our team enables us to implement the key worker system effectively. Whilst Parent(s)/guardians are secure in knowledge that their child enjoys a complete "continuity of care". The person you leave your child with in the morning will pass on any messages and we also use a communication diary for all staff to read when they begin their day. This facilitates a constant dialogue between all concerned, so the simplest of matters can be regularly discussed and quickly resolved. We welcome all your feedback, verbally, in writing or via a scheduled meeting. We believe that consistency and continuity work hand in hand, providing the sound foundation which we build from. We have initial discussions with parent(s)/guardians when their child starts where the key worker introduces the Learning Journey to the parents. The Key worker will explain how it is used and what material goes into it. The meeting is held on a one: one basis in a relaxed atmosphere. 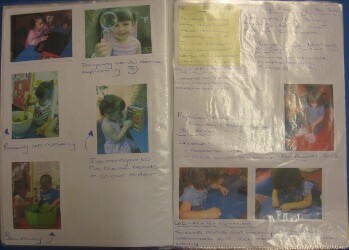 The Key worker prepares appropriate questions for finding a good baseline using the EYFS. The Key worker is then able to plan according to the child's interests, needs and stage of development. We complete the children's 2 year checks and invite parent(s)/guardians to come into the nursery to discuss our findings. We have found that this information is both educative and helpful. During the meeting sufficient time is allowed in order for you to browse through your child's Learning Journey and discuss their development in more depth. We welcome your feedback and encourage any comments or suggestions that might help your child's learning journey, well being and happiness. 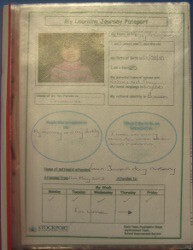 You will receive your own copy of the report to take home, we follow a similar report format throughout your child's journey with us, initially as part of our discussions (commencing your child's start date) followed by transition meetings in order for you to meet, discuss and liase with your child's new key worker as they progress from room to room. Questionnaires are distributed on an annual basis this enables us to obtain feedback, suggestions and any comments relating to any aspect of your child's development or our nursery. We take on board all the findings you have kindly provided and then we build from them. We truly dedicate ourselves to your children, their progression and our nursery. At the beginning of each day staff greet parents/carers and will find out any information needed for that day and at the end of the day staff will inform parents/carers of their child's day at nursery we send home their Communication Diary which states, what they have eaten, nappy/toileting routines and the activities they have enjoyed doing and any other information. We have a WOW board (situated in each room). This is a two way communication from home to nursery and vice versa where the parent(s)/guardian can write anything that they would like to share. For example days out, achievements, observations etc. We constantly thrive to meet the individual needs of every child. We work with outside agencies (social services, portage, speech and language...) and the child's parents/guardians and with their help and support we provide the resources each child needs. Whether it be one: one support recommended and funded by the government, reward charts, pictorial resources etc. The Communication Diaries have information about your child's day, what they have eaten, their toileting, sleep routine and what they have enjoyed doing/achieving and this may include a picture of your child. They have room for your comments from home. We also communicate with parent(s)/guardians through email, on the phone, in writing and through posters/letters on the windows.